NEW YORK (AP) -- If you've ever sold something on eBay, you may have been pleased to receive positive feedback from the buyer. Multiply that by a million, and you can imagine how Jack Sheng feels. Sheng, 33, owns Los Angeles-based Eforcity Corp., which has been selling electronics accessories on the online auction site since he started his business in 2000 with two childhood friends. In the past two months, four separate eBay user IDs belonging to Sheng and his company each surpassed more than 1 million feedback points. No one else on eBay has come close. EBay sellers can get a positive feedback point from a buyer by sending items quickly, having them arrive as advertised and helping to solve any issues that come up. Those positive customer points are offset by any negative ratings the seller receives. Eforcity employs almost 200 people, which is many more than it had eight years ago. Back then, it was a part-time job for Sheng, who used to work as a technology consultant for PricewaterhouseCoopers. After about two years, he and his friends began working full-time on Eforcity and hiring other employees. Sheng realized about six months ago that Eforcity would probably hit the 1 million feedback marks this year. "It's a great morale booster for our employees," he said. His advice for new eBay sellers? Find your own niche. "If early on if we'd tried to sell electronics rather than electronics accessories, we might be out of business right now," he said. Sheng is a ways ahead of the No. 2 feedback holder on eBay, a DVD and CD seller with a score of about 754,000. 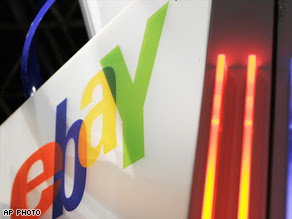 EBay planned to honor Sheng in a ceremony at its San Jose, Calif., headquarters Thursday afternoon, with Chief Executive John Donahoe in attendance.